Remember in 2015, when ATF decided M855 ammo was a problem? Remember in 2015, when ATF decided M855 ammo was a problem? 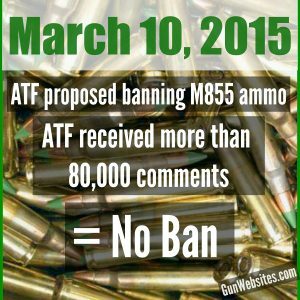 Remember how public opinion & feedback prevented ATF from following through on any ban #BeTheChange #M855 #AmmoBan #JustTheTip #GreenTip #ArmorPiercing ATF received more than 80,000 comments ================== For Immediate Release Tuesday, March 10, 2015 Notice to those Commenting on the Armor Piercing Ammunition Exemption Framework Thank you for your interest in ATF's proposed framework for determining whether certain projectiles are “primarily intended for sporting purposes” within the meaning of 18 U.S.C. 921(a)(17)(C). The informal comment period will close on Monday, March 16, 2015. ATF has already received more than 80,000 comments, which will be made publicly available as soon as practicable. Although ATF endeavored to create a proposal that reflected a good faith interpretation of the law and balanced the interests of law enforcement, industry, and sportsmen, the vast majority of the comments received to date are critical of the framework, and include issues that deserve further study. Accordingly, ATF will not at this time seek to issue a final framework. After the close of the comment period, ATF will process the comments received, further evaluate the issues raised therein, and provide additional open and transparent process (for example, through additional proposals and opportunities for comment) before proceeding with any framework. Thank you for your interest in ATF’s proposed framework for determining whether certain projectiles are “primarily intended for sporting purposes” within the meaning of 18 U.S.C. 921(a)(17)(C). The informal comment period will close on Monday, March 16, 2015. ATF has already received more than 80,000 comments, which will be made publicly available as soon as practicable. Although ATF endeavored to create a proposal that reflected a good faith interpretation of the law and balanced the interests of law enforcement, industry, and sportsmen, the vast majority of the comments received to date are critical of the framework, and include issues that deserve further study. Accordingly, ATF will not at this time seek to issue a final framework. After the close of the comment period, ATF will process the comments received, further evaluate the issues raised therein, and provide additional open and transparent process (for example, through additional proposals and opportunities for comment) before proceeding with any framework. This entry was posted in Firearms Laws and tagged Ammo, ATF, BATFE by gwebs. Bookmark the permalink.